Samuel J. “Buddy” Silberman now has two sets of recordings related to his tenure as Federation President and Campaign chairman available at access.cjh.org. In 1982, Mr. Silberman contributed an oral history interview for the Federation of Jewish Philanthropies of New York Oral History Project. But, earlier in 1957, Mr. Silberman participated in a campaign workshop conducted by the Federation recorded on a set of wire spools. The recording being available online marks a 56th anniversary of sorts. The wire spools for the recording are labelled September 17, 1957, 7:00-7:50 PM and 8:00-8:35 PM. The session is billed as the first Federation of Jewish Philanthropies of New York Campaign Workshop and features the following speakers: Arthur C. Fatt, advertising executive and member of the Committee on Fund-Raising; Gustave L. Levy, Federation President; Samuel “Buddy” Silberman, Campaign Chair; Nathan W. Math, member of Committee on Fund-Raising; and Lawrence Marx, Jr., Chair of the Committee on Fund-Raising. The workshop focuses on the 1957 Campaign, “116 gifts in one to get the big job done,” telling the story of the Federation and the increased needs of Federation-affiliated agencies, media coverage of the 1957 campaign, tips on solicitation of donors and preparing for campaign events, suggestions relating to card-calling, and a brief feedback session with the lay leadership in attendance. The reference to 116 pertains to the number of Federation-affiliated institutions and agencies in 1957. The digitized recording provides insight into the coordination of a particular campaign, but also some understanding into the growth and financial needs of Federation agencies, concerns associated with fundraising in New York City in lean times, and what public speaking entailed at the time. However, please be advised that Spool 1, from 0:35-1:30, contains a racial epithet and possibly additional inappropriate language in Arthur C. Fatt’s opening to the workshop. For our UJA-Federation of New York project, we will be creating an online finding aid to the collection. A finding aid is a document that contains detailed information about a specific collection of papers or records within an archive. Finding aids are used by researchers to determine whether information within a collection is relevant to their research. A finding aid is the fruit of an archivist’s painstaking work of culling, sorting, ordering and describing a collection of historical records. Like a book jacket it summarizes the importance of a collection (Scope Note) and like an index it lists the specific contents (Box lists). The finding aid places the materials in historical context by providing information about the author or institution (History/Bio note) that created the collection. It presents all the information the user needs to provide access to the processed materials. An online finding aid is created by using a freely available standard known as Encoded Archival Description (EAD). An EAD is essentially a valid XML (eXtensible Markup Language) document. This document is composed of structural metadata, i.e., information that is structured in a certain way that, when combined with an XSLT stylesheet, presents the data in a browser that can be viewed by users. EADs can be viewed by anyone around the world with an internet connection. When an EAD is requested by the user, the finding aid is converted and parsed “on-the-fly” using an XSLT stylesheet and transformation engine into HTML that can be viewed in the browser. XSLT is a language for transforming XML documents into HTML and provides developers the opportunity to define and control the style of any element or a set of elements in the EAD XML document tree. The EAD standard is currently undergoing revision by the archives community and is expected to be implemented in the coming months at the Center for Jewish History (CJH). The new standard will use an XML schema instead of a Document-Type-Definition (DTD). We will use the new standard to encode the UJA-Federation finding aid when it is eventually completed over the next few years. The EAD will be encoded with wonderful software called NoteTab Light; OxygenXML will be used primarily for debugging. The online finding aid will fuse together three important components that archivists create and deliver for each collection they process: 1) arrangement, 2) box inventory, and 3) description. The arrangement component defines how the collection is organized as a hierarchy (subgroups, series, subseries, subsubseries, subsubsubseries) and is encoded into the Arrangement section of the EAD. The box inventory is basically a folder-level inventory of all the boxes in the collection which also reflects the organization of the collection, i.e., each folder belongs to a particular subsubsubseries (yes, that’s 3 subs!). We are currently creating Excel databases for each chunk of the collection that we process. The box inventory will be encoded into the Container List section. Descriptions will include scope and content notes that will accurately describe each chunk (the series, subseries, etc.) organized and defined by the archivist. These scope notes describe the arrangement and provide a historical context which can help researchers decide if the information in the series is pertinent to their research. A historical note for the entire collection will be created once the entire collection has been processed and will provide a historical context of the collection. A scope and content note for the entire collection will be created which describes how the entire collection is organized. For our UJA-Federation of New York collection, five subgroups have been defined and each subgroup will have its own “child” finding aid. An example of an EAD is the Oral History subgroup EAD (http://findingaids.cjh.org/?pID=365697) which has links to oral histories for UJA-Federation leaders, arranged by last name in A to Z order. The EADs will be ingested into a digital asset management system (currently ExLibris’ DigiTool is used at the Center for Jewish History), and the descriptive summary metadata about the collection will be added to the catalog record to which the finding aid is linked, all of which will make intellectual access to this large collection possible. We expect that the complete finding aid to the collection will be available at the end of 2015. Please follow our blog to stay updated on our progress and findings as we process the collection. The following “New Year’s greeting” image was found recently in the files of the Design and Printing Department of FJP, under Public Relations – Marketing and Communications. It was most likely the official Federation New Year’s card that year, sometime in the 1950s or 1960s. Many printed items like this card survive only in the files of the Design and Printing Department, which should turn out to be a good resource for researchers. 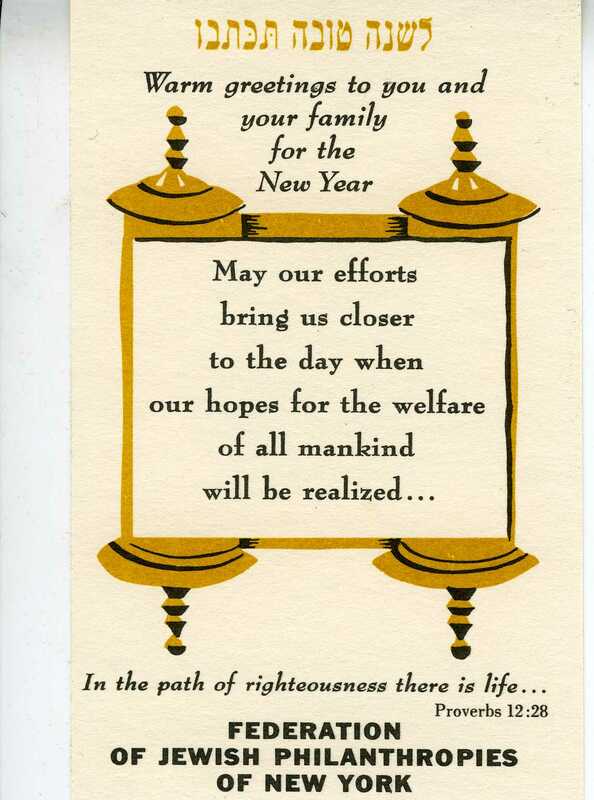 The AJHS UJA-Federation of New York project team wishes our readers a happy and healthy new year.